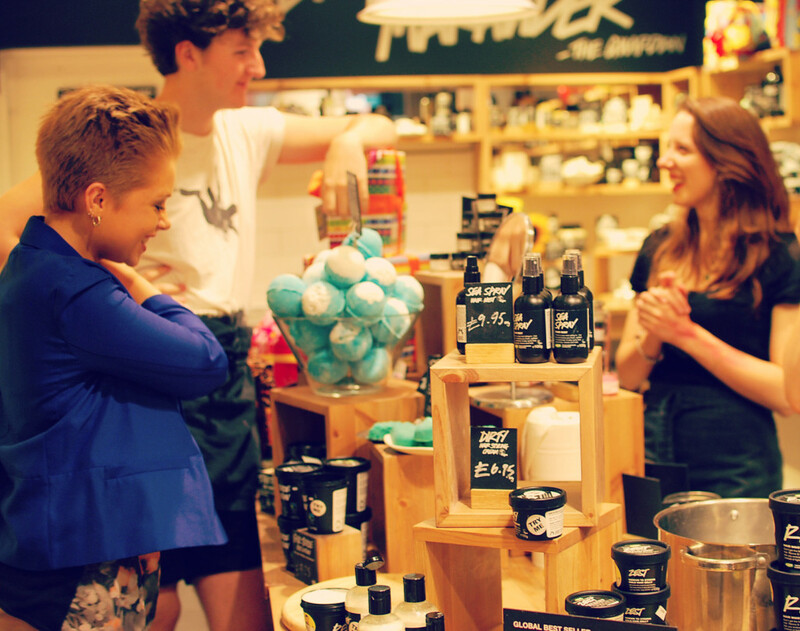 A few Fridays ago we had the pleasure of attending a blogger evening at the Cribbs Causeway branch of Lush in Bristol. As big fans of their colourful bath bombs and ethical approach to creating natural cosmetics, we were super keen try out some new products and to catch up with local bloggers and fellow Lush fangirls Lily and Charlotte. What a slick event it was too! Comprising of five different stations to visit where the lovely Lush ladies (and gent) discussed hair, body, skin and sun care, as well as introducing us all to their pretty extensive make up range. The sun care products were particularly interesting, and we were suitably awed by the sunblock bar, a clever wash on, rinse off block of sun protection. This is a really novel way of avoiding conventional sticky lotion. As we all know, less time spent applying lotion = more time scoffing ice cream! That’s just basic beauty maths. Our favourite part of the evening was getting the chance to create our own Catastrophe Cosmetic face masks. Many blueberries were harmed during the making of the masks! After (extensively) testing the end product, we have both been genuinely taken aback with the results. After each application, our skin looks clean, clear and unusually healthy. Since getting our hands on these delights, we’ve become so obsessed that we’ve decided to try them all, even popping into the Brighton branch of Lush during our girly weekend away to pick up three more. We are both truly convinced that the calming Catastrophe Cosmetic makes our skin look and feel heaps better and would be interested to hear if others agree. What is your all time favourite Lush product?